Could Mars have experienced a colossal global warming? I recently wrote about new observations of Mars that reveal Mars once had a liquid ocean (post here) and it piqued a lot of interest. So, I thought it would be nice to follow up that story by offering one possibility for how a young Mars could have sustained a liquid water ocean. Just as a refresher though, the idea is that although Mars is cold and dry today, there is pervasive evidence that there was once liquid water. How is this possible though? Mars teeters on the edge of the canonical “Habitable Zone” (check out this bite on Hz definitions), where liquid water can exist on the surface, so there must’ve existed a period of time when the conditions on Mars allowed for a warm surface. Ramirez et. al. model the climate of Mars 3.8 billion years ago, in an attempt to settle this 30 year old mystery. One possibility is that Mars was wet and warm because of the Late Heavy Bombardment. The Late Heavy Bombardment was a period of time about 4.1-3.8 billion years ago when the inner solar system was getting pummeled with a large number of asteroids. When an asteroid collided with the surface, the surface would temporarily heat up, due to the huge explosions. Each time there was a collision, the surface was warmed for brief intervals, allowing liquid water to flow. Although this seems reasonable, the valley networks on Mars are incredibly complex, analogous to the Grand Canyon. You need about three orders of magnitude more water to carve out the valley networks on Mars than the Heavy Bombardment predicts you would get. So unless geology on early Mars worked entirely different than geology on Earth, this hypothesis doesn’t really work. Another possibility is that greenhouse gases warmed Mars with a thick CO2 H2O atmosphere. In other words: the most extreme form of global warming. Every time we introduce more greenhouse gases, such as CO2, into our own atmosphere, we raise the mean surface temperature. On Earth we have about 0.04% CO2, so one can only imagine the temperature of an atmosphere that was, let’s say, 95% CO2. As it turns out, greenhouse gases have not been able to produce above freezing temperatures. The problem is that not only was Mars different 3.8 billion years ago, so was the Sun. The Sun was 75% as luminous than the Sun today. The figure below shows the surface temperatures on Mars for a predominantly CO2 atmosphere at different solar luminosities. Between 70-80% present day solar luminosity (S0), Mars cannot be warmed with just CO2. Something is missing. Ramirez et. al. try and fill in that gap with their 1-D climate models. This figure shows the mean surface temperature of early Mars as a function of surface pressure for a 95% CO2, 5% N2. Different colors correspond to different fractions of present day solar luminosity, S/S0. The curve of interest is the orange and blue which show that for 70-80% present day solar luminosity you cannot attain above freezing temperatures. When water was present on the surface, the Sun was roughly 75% its present day luminosity. Take away: 95% CO2, 5% N2 alone does not provide enough to warm early Mars. It seems counterintuitive that hydrogen would be an effective greenhouse gas because it is not a strong absorber in infrared region of the electromagnetic spectrum. However, when H2 collides with CO2 and N2 molecules it bumps H2 into a higher excited state, letting it absorb in the 8-12μm region of the electromagnetic spectrum (smack dab in the middle of the mid-infrared region). Introducing this effect into the climate models Ramirez et al. were able to get above freezing temperatures, with one caveat: they need at least 5% H2 to do so. 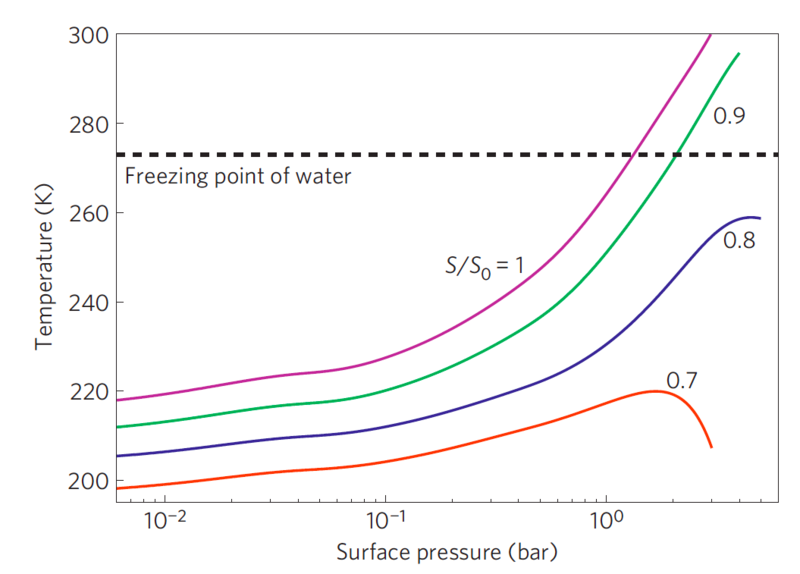 Figure 2 shows this nicely since the magenta 5% H2 95% CO2 atmosphere just barely skims the dashed line representing the freezing point of water, at a pressure of 3 bars. The conclusion: in order for Mars to be warm via this process, you need an atmosphere that was at least 5% H2, 95% CO2, with a surface pressure of 3 bars. This figure is similar to the figure above but now the authors have added in warming effects from H2 and all these curves correspond to early Mars conditions (S/S0 = 0.75). Each curve corresponds to different amounts of H2. 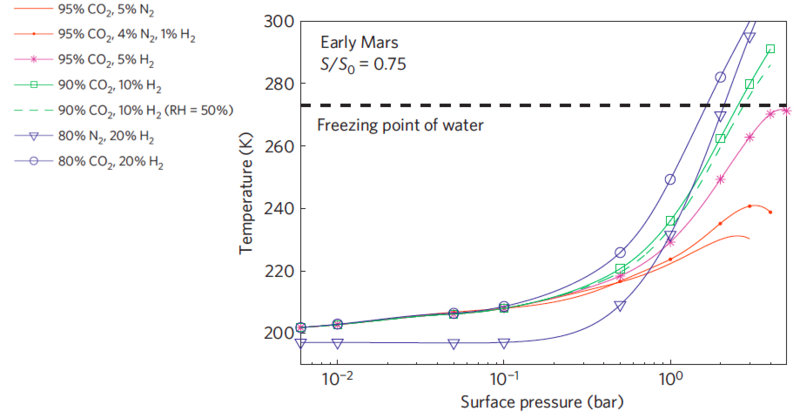 Take away: For this mechanism to warm early Mars, you need at least 5% H2 and a surface pressure of 3 bars. Can Mars retain 5% H2? Because hydrogen is so light, it gets flung out of the Martian atmosphere (for those in intro physics, the kinetic energy of H2 overcomes the gravitational energy of the planet). Therefore, the discussion leaves the realm of climate studies and enters the realm of geology. In order to know what was going on in the atmosphere 3.8 billion years ago, we need to know what was going on at the surface of Mars. If you can argue that there was a constant supply hydrogen getting pumped into the atmosphere through geologic processes on the surface (mostly volcanism), then the question of whether or not Mars can retain 5% H2 becomes irrelevant. Ramirez et al. argue that we are unsure of what was going on 3.8 billion years ago (seems understandable), but that if we use what we know about Martian meteorites and the Martian surface today, it is entirely possible to get enough H2 solely from volcanoes. Hopefully new data from the Mars Science Laboratory will be able to test these hypotheses by looking at the ancient rock record on Mars. Until then, the 30-year-old Martian climate mystery will remain unsolved. Born in Brazil, raised in CA... I somehow ended up in the tundra of Ithaca, NY for undergrad at Cornell studying physics. I spent my undergraduate days dancing and studying exoplanets and am now a 3rd year graduate student at Penn State studying astrophysics and astrobiology. I'm currently working on atmospheric photochemistry with Jim Kasting, a JWST exoplanet simulator with Jason Kalirai and Avi Mandell, and am conducting some laboratory experiments on biosignature gases with Chris House. Outside of academia I'm involved in an awesome organization called "Learn to Be", which provides online tutoring for underserved communities. We are always looking for more tutors, so please contact me if you are interested! Hello Natasha – many thanks! But I’d be grateful for a bit of clarification, please. Using the same example of my age, when I was 75% of my current age, I was 60 • 0.75, that is 45 years old. Am I muddled about what these 75% references mean? Or should the first quote read “as luminous” instead of “less luminous”? Hi Margarita. Great catch!! You are correct. I did not mean “less luminous”, I meant “as luminous”. That was a pure error on my part. Thanks for the clarification. Nice findings, thanks! I’ve heard of the H2 effect before I think, but did not know it is now the only (?) viable candidate for the early Mars atmosphere. This would tie in with the same faint young sun problem on the Hadean/Archean Earth. If Mars got a 60 K greenhouse boost, Earth could have gotten something like it too, give or take the different atmosphere models. Possibly then the Earth was robustly protected against freezing well into the early Archean. Hi Torbjörn. Thanks for this insightful comment. 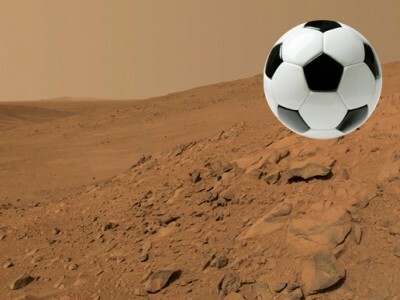 First I will caution you against thinking that this is the only viable candidate for early Mars. The reason the greenhouse hypothesis is favored (and this is very controversial) is that the valley networks on Mars are analogous to the grand canyon.. They are HUGE! And so, to carve out that much land you need a prolonged period of warming. Several other hypothesis argue for transient warming episodes. Anyways, if you are interested in this topic I can point you to a few other papers on this subject. People have also thought about this in regard to early Earth. In order for it to work for early Earth the continent would have had to be very reduced (early Mars is thought to have been much more reduced than Earth). A reduced atmosphere gives you higher H2 outgassing. One of the things you should be aware of is that in order to get high amounts of H2 you need a direct source of H2 outgassing (i.e. you need a replenishing source). H2 is a light gas and so, it readily escapes from the atmosphere.